Willy Lara: I heard about the contest through The Berrics Instagram. How did you arrive at your idea for your submission? Any inspiration? Bryce Chapnick: We didn’t really have much of a plan. Willy is known for long flowing lines and if you have ever witnessed him skate in person, you know he is already having tons of fun. I guess you could say Willy’s skating was the inspiration. What was the process behind your submission? Was it planned or spur of the moment? Willy Lara: It was actually not planned at all. I saw the contest on Instagram with about 3 days left before the contest closed for May. I tagged Bryce in the post and we got it done the next day. We were really just messing around and it turned out we ended up winning–which was super rad! Willy Lara: I feel it shows skateboarding is fun because this is just what I do every day with all the homies. Just skate, film and travel. And that’s what really makes skateboarding fun. Upon submission how did you feel about your chances? Willy Lara: I felt we had a 50-50 chance. I didn’t think we were gunna’ win but still wanted to give it a try. Willy Lara: I was super stoked when I found out I won. I was in Brazil and turned my phone on, first thing that came up was The Berrics Instagram post saying I won. I was beyond stoked! Willy Lara: My favorite part about filming with a GoPro is the quality is unbelievably good. Especially for its size. Bryce Chapnick: I am always impressed with how GoPro footy comes out. It took a long time to figure out how to film the line properly but because of the awesome wide angle shot the GoPro gets, it worked out perfect! The best part is we filmed this on an older model GoPro. So don’t be fooled these things have longevity. Do you plan on submitting again next month? Will your strategy be the same? Willy Lara: Yes, I do plan on filming a few more videos. It’s worth a shot! Bryce Chapnick: You better believe we’re filming more. We’re trying to win the whole thing. Any advice to future submitters? Willy Lara: My advice to future submitters is that it’s all about having fun and enjoying skateboarding. Finally, if you won the $20,000, what would you do with the cash? How would you feel? 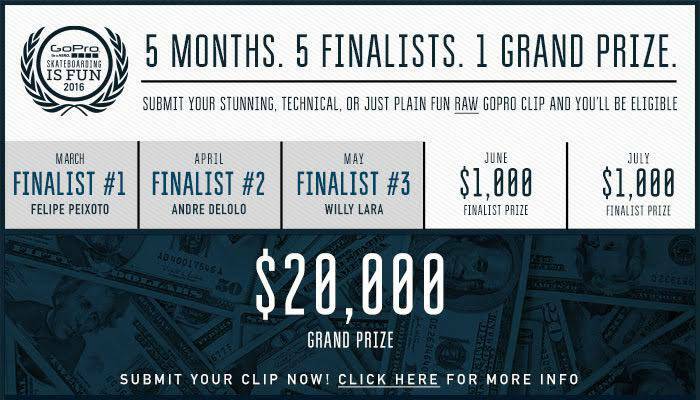 With a week or so left to submit your best raw GoPro Clips, our next $1,000 monthly winner is still out there… So call up your friends and break out your GoPros for a chance to win $20,000! Somebody has to win… Why not you? SUBMIT NOW!